West Indian Lemon Grass. (cympopogon citratus) Bulbs, or leaf bases, are used in Vietnamese and Thai cuisine. Lemon scented leaves can also be used for cooking, and tea. Tender tropical plant will need to be overwintered indoors or in a greenhouse. Sterile, does not produce seed heads. Cannot be shipped during extremely cold temperatures. Perennial zones 11+ Live plant in 3 inch container. 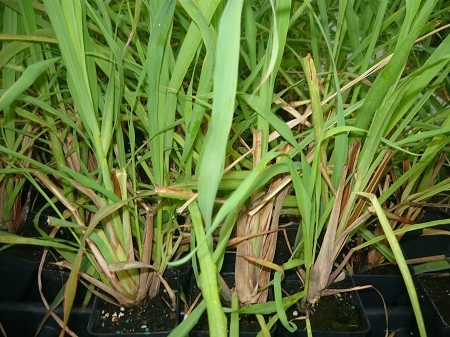 I received a beautiful, large and healthy lemon grass plant, exceeding my expectations. Planted it in a pot for over wintering indoors. Thank you!